SRCE (Romanian Aesthetic Surgery Society). BAPRAS, SRMR, RSSH, ROAPS and SRCE members are the members who paid their membership for 2018-2019. In case you decide to use wire transfer, please specify the name and surname of the participant you are paying for and the event (ex. 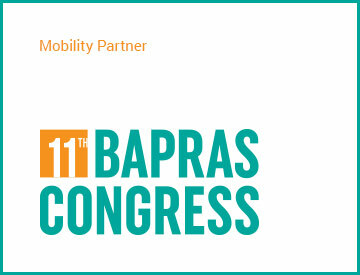 Participation Fee for BAPRAS Congress 2019). The value of the Participation Fee is the one from the moment of payment, according to the deadlines from the FEES chart. Please note that Romanian citizens will have to pay in RON. Only foreigners will be able to make payment in EUR. For the participants who register and pay the Participation Fee after 20.04.2019 we can’t guarantee the congress bag and other materials. In case the participants don’t present the participant badge, the organizers have the right to restrict their access in the event.